In the world of business, service, and sales, no matter how confident, competent or experienced you are, setbacks are a part of every process. How well you handle those failures, challenges and problems will often determine how successful you are going to be. Michael Licenblat is a resilience expert who teaches people how to achieve more in high-pressure environments by bouncing back from pressures, setbacks, and rejections. In Michael’s upbeat, interactive and hands on presentations, he takes you into the world of reading ‘pressure patterns’ and building personal resilience so that you walk away with practical ideas on how to ‘keep your drive alive’. 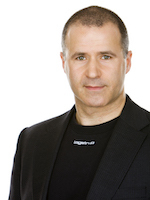 Michael is the author of ‘Pressure Proof – how to thrive in time of disruption, change, and pressure’. His articles are regularly published in several journals and, among his clients, he has delivered presentations to Toyota, Chemmart, REIV, Coles Myer Ltd., Pitcher Partners, St George, Smartline, SEEK, Hocking Stuart, Maurice Blackburn Lawyers, Maunsell, SalesForce, and the Victorian Parliament.